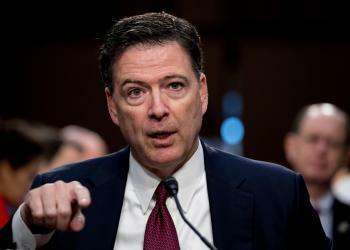 James Brien Comey Jr. (born December 14, 1960) is an American lawyer who was the 7th Director of the Federal Bureau of Investigation (FBI) from 2013 until his dismissal in May 2017. Comey had been a registered Republican for most of his adult life; in 2016, he described himself as unaffiliated. Comey was the U.S.
Latest news and discussion about former FBI director James Comey. Sarah Sanders tell Sean Hannity that revelations she lied to the press were a "slip of the tongue." While the headlines about special counsel Robert Mueller's report have focused on the question of whether President Trump obstructed justice, the report also gave fresh details about Russian efforts to hack into U.S. election systems. In particular, the report said, "We understand the FBI believes that this operation enabled [Russian military intelligence] to gain access to the network of at least one Florida county government" during the 2016 campaign. That came as news to Paul Lux, president of the Florida State Association of Supervisors of Elections — which has been working closely with federal authorities to protect their election systems against such attacks. "I haven't heard even a whisper"
The Kremlin said on Friday U.S. Special Counsel Robert Mueller's long-awaited report did not contain any evidence the Russian state had meddled in the 2016 U.S. presidential election. Mueller's report, released on Thursday, details extensive contacts between Donald Trump's 2016 campaign and Russian operatives who, it said, sought to tilt the election in Trump's favor. Speaking to reporters on a conference call, Kremlin spokesman Dmitry Peskov said Moscow regretted the Mueller report was having an impact on its relations with Washington. Although the special counsel's report on Russian interference does not come to a conclusion as to whether President Trump obstructed justice, Robert Mueller's team did examine 10 "discrete acts" in which he may have done so. The report says these 10 instances can be divided into "two phases, reflecting a possible shift in the president's motives." The first phase took place before Mr. Trump fired his first FBI director, James Comey, after he had been reassured he was not personally under investigation. After Comey's dismissal and Mueller's appointment as special counsel, the report indicates, the president knew he was now under investigation for possibly obstructing justice, and switched gears. If special counsel Robert Mueller‘s investigation makes one thing clear, it’s that many of the news reports that President Donald Trump branded as “fake news“ were, in fact, very real news indeed. While Mr Mueller’s report didn’t establish a criminal conspiracy and was “unable” to conclude that obstruction of justice occurred – contrary to hours of speculation among cable-news pundits during Mr Mueller’s long investigation – it also largely validated news accounts that Trump dismissed or disparaged. Instead, at least in the Mueller team’s analysis, the fake news seems to have flowed not from the media but from the other direction. Before the redacted Mueller report is released, following Attorney General William Barr’s Thursday-morning press conference, here are the moments that brought us to it. Bold statements made in public by members of President Trump's administration were shown to be lies under the harsh light of Mueller probe.